A Victorian Jar of Sweetshop Penny Mix - A beautifully elegant Victorian-style jar filled with our most nostalgic sweetshop favourites.... you'll find everything from Fried Eggs to Fizzy Cola Bottles to Fizzy Strawberries to Banana Mallows (among many many others)! The jars are made of plastic (so no risk of breakages) and they're medium-sized... they feel lovely and substantial and make a fabulous gift! 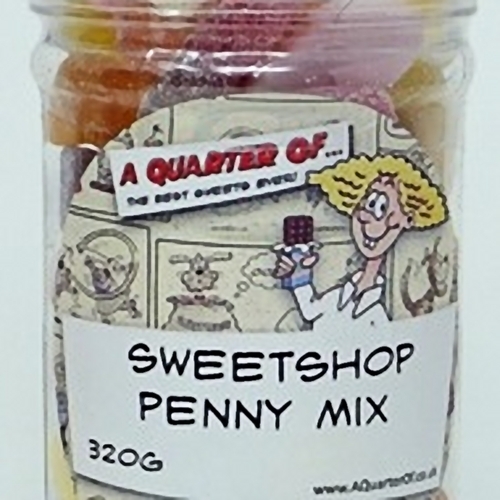 Each jar contains 320g (0.7lb) of Penny Mix (that's a lot of sweets!) and measures 17.5cm x 7.5 cm (that's 6.8 x 2.9inches). Glucose Syrup, Sugar, Gelatine, Dextrose, Glazing Agents( Vegetable Oil, Beeswax, Carnauba Wax).